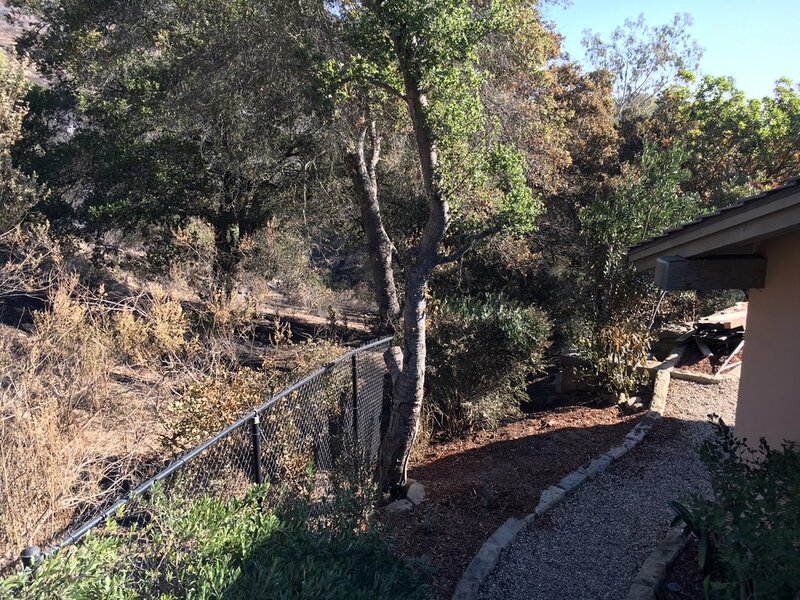 In 2017, the Thomas fire came within inches of my parents’ home. My grandparents built the house in 1972, and my parents bought it from them in 2000 and remodeled it as their forever home. So, I didn’t grow up there, but for my entire life it has =been a beloved place to be with family and celebrate holidays. Charred brush on the left, house on the right. That whole fall was a wild ride. In an unrelated but unfortunately timed water based incident, the bottom floor of the house flooded and my parents had to move everything upstairs so that reconstruction could begin. Then, the fire came, and they packed up what they could fit in their cars and evacuated. Then came the mudslides, and there was no access to the house for weeks. When the roads were cleared, the house stood in a sea of burned landscaping and melted pool equipment, full of sooty walls and smoke-damaged furniture and clothing. There are so many ways in which I’m thankful, beyond words and with some significant amount of survivors’ guilt. Of course, that my parents were safe the entire time. That our home was still intact, while so many people we know and love lost everything. That our family has the resources to rebuild. That amazing firefighters came from so far away to work so hard to defend our neighborhood (shout out and huge thanks to the Moraga Fire Department http://www.mofd.org/!). That the Montecito community came together to take care of its own. This is how warm it gets inside a house surrounded by fire. And I’m thankful that my dad is the most organized person I know. Because I am here to tell you, when then entire contents of a home have been relocated within it AND packed up for evacuation AND packed up again for post-disaster cleaning, you are really and truly glad from the bottom of your soul that every object has a designated location. When I went to Santa Barbara to help my parents move back into the house, the three of us unpacked for three straight days. I did not take a picture of the pile of boxes that was delivered to the driveway, which was a big miss, but suffice it to say it was truly heroic. And yet, by the time I came back to San Francisco you would never have known anything had ever happened. If my parents hadn’t had such an organized home in the first place, it would have taken us three times as long with three times as much frustration… maybe more! I fervently wish that none of you reading this ever have to evacuate due to natural disaster, let alone lose your home. But based on my experience, I would heartily recommend getting your home organized and inventoried (might I suggest pictures of the insides of cabinets? Those would have helped even more!) as part of your personal emergency plan. Happy Thanksgiving to you and yours. I’m thankful for you!